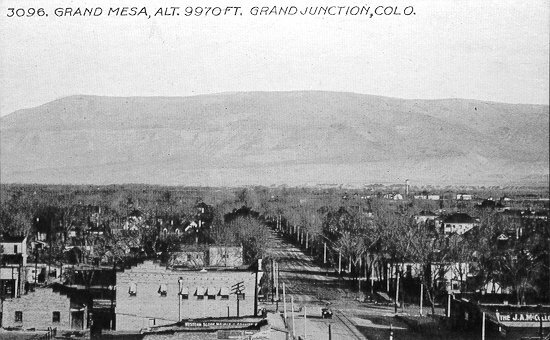 Gunnison River Basin and the Surface Creek Valley. More Surface Creek Watershed coverage here. Last March Cedaredge public works director David Smith told the trustees that the wastewater treatment plant exceeded the planning threshold for organic capacity levels three times in the past year, and that now was the time to start planning for a solution. To that end, the trustees approved JVA Consulting‘s proposal to create planning documents based on the evaluation of the existing wastewater treatment facility and anticipated effluent limits. McGibbon provided the trustees with an overview regarding the current wastewater needs for the town; an evaluation of the existing treatment facility; organic loading capacities; recommended design alternatives; and future operations of the wastewater treatment plant, including the most cost effective alternatives. JVA’s recommendation is for the town to build a new mechanical wastewater treatment facility near Surface Creek, with total capital costs projected to be nearly $3.4 million, plus $1.3 million in operational and maintenance costs. McGibbon provided the trustees with a four-year implementation schedule to begin in October, with a startup date for the new facility of December 2015. Town officials conducted a tour last week to view a new water diversion project, take a look at the water treatment plant, and follow the route of the soon-to-begin and already-paid-for Phase I West Side main transmission line replacement project. This year’s completion of the relatively inexpensive and modest looking Ward Creek diversion belies the project’s incalculable importance to the town. For a comparatively paltry $49,000 price of construction, permits, and engineering, the town now has an alternative to drawing reserve water supplies from the difficult-to-process irrigation flows of Big Ditch. In addition to that, the project, as explained by officials, creates the ability to draw town water reserves from the much cleaner water stored in Ward Creek Reservoir and to divert that water directly into a pipeline to the treatment plant. Also during the town trustees’ victory tour last week, water utility superintendent Keith Peterson explained the workings of the town’s water treatment plant. The plant’s two filtration cells are sufficient to supply water users’ needs in normal, day-to-day operations. But, the plant was constructed in 1999 and 2000 with an eye to the future and was built to house two additional filtration cells, doubling the plant’s capacity, if ever needed. Trustees also got a look at the two one-million-gallon storage tanks at the treatment plant site that will be the beginning of the soon-to-begin, seven-mile-long, $2-plus million West Side Main transmission line project. With an expectation that work will be able to begin in September, the 12-inch-diameter pressurized water line will follow a course across country and along road rights-of-way directly south to connect with the town’s storage tank at Eckert on Happy Hollow Road. The project is conceived as an effort on the part of local water providers, including the U.S. Forest Service which administers lands where water supplies originate, to identify threats to source water quality and cooperate on a plan to protect those sources from contamination threats. The water providers involved in the initiative are the Towns of Orchard City and Cedaredge, Coalby Domestic Water Company, and Upper Surface Creek Domestic Water Association. According to Colleen Williams of the Colorado Rural Water Association, a government-funded 501(c)3 that is leading the planning effort, the communities of Collbran, Rangely, and Paonia are all at various stages of developing their own source water protection plans. Williams is the “facilitator” of the effort to develop a localized plan which hopefully in the initial stages will attract grant money for things like fencing and signage to help protect local water sheds. The committee is at the stage of developing management strategies for dealing with a range of source water quality issues including the following ones: Oil and gas development, roads and dust, livestock grazing, wildland fires and forest health decline, noxious weeds, septic systems, and a half-dozen or more other factors. With regulatory hang ups and delays frustrating the Ward Creek Diversion project at almost every turn, [Orchard City Town administrator David Varley] told the trustees at their October regular meeting, “I think it’s pretty much impossible that we’re going to get that project constructed this year.” The seemingly simple and relatively inexpensive idea was proposed last year. It was seen as a way to increase the efficiency of the town’s water system by diverting an existing raw water supply directly into a pipeline to the treatment plant. The project entailed about $38,000 in construction costs, and the town board had good hopes at the outset that the work could be completed in 2009. But contingency planning for the project failed to foresee the entangling involvement of the Army Corps of Engineers and the state Water Quality Control Commission. Varley gave those two agencies most of the responsibility for regulatory delays that will push the project’s completion date into next year. 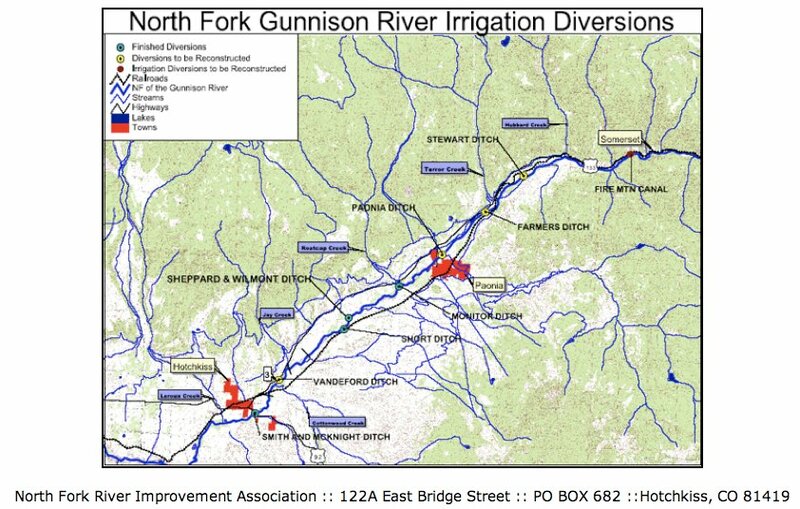 NFRIA is beginning its update to the original 2000 Watershed Action Plan for the North Fork of the Gunnison. This is a chance for citizens to take action in addressing the foremost issues concerning the river. A public meeting is scheduled for Wednesday, Oct. 14, at Memorial Hall in Hotchkiss from 4-6 p.m.
NFRIA would like to assess how the public perception of the watershed has changed during the last nine years. Participation in this meeting will prove valuable for NFRIA in pursuing the goals of all stakeholders in the watershed. They hope to come away with an inclusive list of public concerns allowing them to optimize their efforts. In order to better serve all stakeholders, NFRIA welcomes critique of previous projects and how well they have addressed the initial action plan. This meeting is the first of two public meetings as the first task in updating the watershed plan. The update process will review the science, the state of the watershed, sources of water quality impairment, public concerns, and will set the goals for the next 10 years. Colorado Water Conservation Board is funding this project. The original 2000 Watershed Action Plan can be found at http://www.nfria.org. Contact the NFRIA office with any questions at 872-4614. More Gunnison Basin coverage here. Town Trustee Jimmie Boyd presented the board with the offer he had received for the Leon Lake shares. Boyd explained, “This last week I had a lady approach me with five shares of Leon Lake water for sale. She is asking $5,000 for the five shares, which figures out to a little bit less than $2,500 per acre-foot. That’s about the going rate. “This water,” Boyd continued, “has already been converted to domestic use or as augmentation water, as well as irrigation. The town has 85 shares of Leon Lake at this point, so this purchase would bring us up to 90 shares.” Boyd went on to explain that there are about 3,600 shares total in the Leon Lake water company. “The largest owner has about 225 shares,” Boyd said. “There about 160 owners in the company, so no one individual or owner interest would be hit real hard if some kind of work had to be done on the reservoir.” Leon Lake is located on the north side of Grand Mesa in the Plateau Creek drainage. 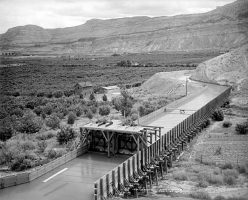 Water is transported to Surface Creek Valley by a tunnel that was constructed decades ago. More Surface Creek coverage here.